Summer parties should encompass all of the joys of the season. What is more Summer that barbequed Ribs? Ok, now that I think about it... burgers are probably more of a traditional Summer meal. But we have burgers all of the time, so step up your grilling this year and offer your guests great BBQ Ribs as a special treat. We used the All-Purpose Barbeque Seasoning as a rub on the ribs. I got our ribs cut at the butcher - they are beef ribs. Giant beef ribs. Step 2 : Bake covered in the oven for 4-5 hours at 250 degrees. Step 3 : Grill on a medium flame for 5-10 minutes until slightly charred. Step 4 : Brush on BBQ Sauce. Cook for 2-3 more minutes. Step 5 : Cover with foil and let set for 10 minutes before cutting. Step 6 : Cut into single ribs. We love Gates Barbeque sauce. It has such a unique flavor - very heavy vinegar and celery seed flavor. Everyone's had these cheesy potatoes made from frozen hash brown potatoes. These are always a crowd pleaser - ultimate comfort food. Like most men, Mike is good with just meat and potatoes. But when I'm eating spicy BBQ and rich cheesy potatoes, I need something cool, fresh and crunchy. Enter cole slaw. I used a basic recipe of cabbage, carrots, mayo, milk, sugar, vinegar and a little cayenne pepper. 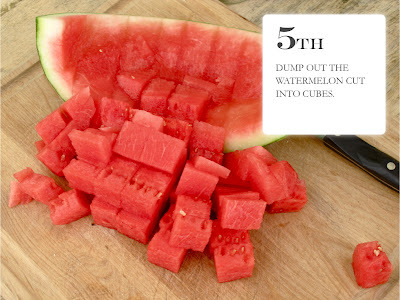 No Summer celebration is complete without watermelon. Which is great, because it might be the world's easiest food to prepare... besides that it can be messy and, well, watery. I came up with a really simple way to cut watermelon in a hurry. Get the step by step tutorial here! 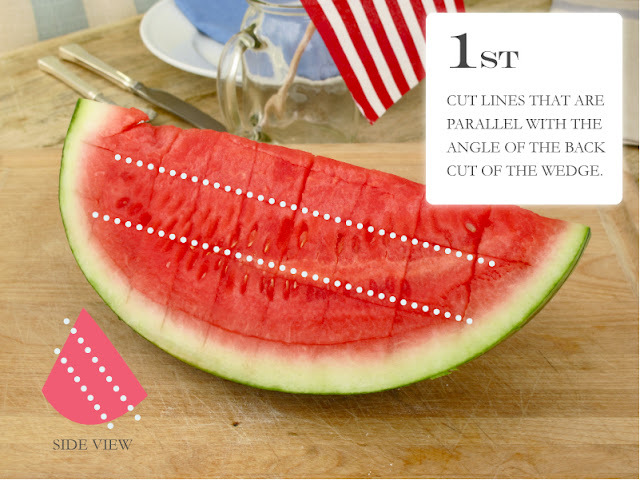 Don't worry, I haven't gone crazy yet - it is not too complicated (I mean it is just cutting watermelon, after all...), just hard to explain verbally, so I decided to do it visually. Humor me and check it out - it really will make it easier for you. Here's the easy-to-pin snapshot for pinterest!